Lisa Genova is the author of the New York Times bestsellers Left Neglected and Still Alice. She graduated valedictorian from Bates College with a degree in Biopsychology and holds a Ph.D. in neuroscience from Harvard University. She travels worldwide, speaking about the causes, treatments, ways to prevent, and what it feels like to live with Alzheimer’s Disease. She has appeared onThe Dr. Oz Show, The Diane Rehm Show, CNN, Chronicle, Fox News, and Canada AM and is featured in the documentary film, To Not Fade Away. She lives with her husband and three children in Cape Cod. Beth has just discovered her husband has been having an affair. She kicks him out and struggles to figure out what happened to her once promising life where she had planned to become a writer. Instead, she has ended up on Nantucket Island raising her three girls and a dog. While the girls are at school, Beth decides to follow her heart and start the book she always wanted to write. While at the library, she finds a book that inspires her to finish one of her short stories about a child with autism. One night, in despair, she rips up all the family photos that include her husband. The girls are upset, so Beth sets out to find a new photographer to replace the pictures. 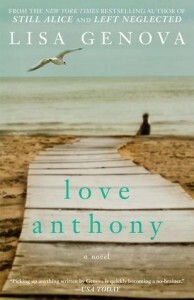 Olivia, has spent the last two years mourning the death of her son, Anthony, who died of a seizure. Anthony was diagnosed with autism and she spends all of the family savings and goes into debt to find him help. Her marriage is finished and she retreats to the vacation home they bought as an investment. As a former editor of self help books, she fills her time with reading and develops her hobby of photography into a business that can support her. Beth and Olivia connect at a photo shoot and when Beth discovers that Olivia is an editor, she asks her to help her with the book she has written. The book turns out to be far more intimate and Olivia is overwhelmed that Beth has written her son’s story from his point of view and in what seems his own words. I have read Genova’s previous books and enjoyed both of them, but I think that this is probably my favorite so far. I learned so much about how autism can effect a family to the point of bankruptcy and can destroy the relationship of the family. The characters are people you know, like the friend who finds her husband cheating, the family with a devastating illness and how much friends can help you recover. Beth has an amazing support system that all rally around her. Olivia seems to be so alone but she takes the time to find herself and recover. This book will be an excellent choice for a book group. Fans of Jodi Picoult should adore this one.